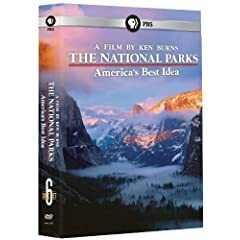 Ken Burns' latest PBS documentary series, The National Parks - America's Best Idea, debuted last week on television, and is available as a 6-DVD box set on store shelves tomorrow. Other television releases available tomorrow include Ally McBeal: The Complete Series, Bones: The Complete Fourth Season, and Stargate Atlantis: The Complete Series Collection. For more classic comedy, check out The Mary Tyler Moore Show - The Complete Fifth Season and Mister Ed: The Complete First Season. Set 1 and Set 2 of the 1960s black and white classic anime cartoon Astro Boy clearly outclass the later full-color versions, and are out on DVD tomorrow. Anvil: The Story of Anvil is one of the better music films I have ever seen. Other feature films out on DVD tomorrow include the "Ozploitation" documentary Not Quite Hollywood and Jack Black's Year One. Disney releases a Blu-ray edition of its animated classic Snow White and the Seven Dwarfs including a 2-DVD set complete with plush dwarves. Christmas classics out tomorrow on Blu-ray include A Charlie Brown Christmas, How the Grinch Stole Christmas, and both the 1947 and 1994 Miracle on 34th Street films. Other Blu-ray movies in stores this week include Contact, Ghost Ship, and Mary Shelley's Frankenstein. It's My Party and I'll Die if I Want To! What can you recommend buying or adding to your Netflix queue from this week's DVD releases?